2007 Jayco Melbourne 29C Class-C Motorhome. 2 slide outs- Living room and bedroom. Sleeps 6. Excellent Condition. 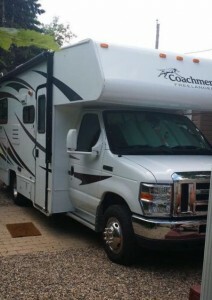 New coach batteries and all new rubber this spring. Full body paint. Please call 204-476-6222. 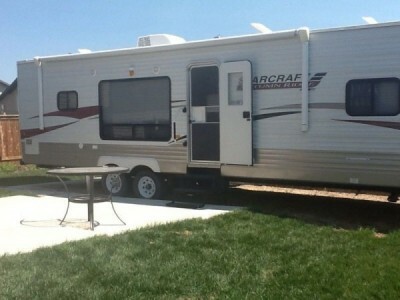 2009 Starcraft Autumn Ridge 315RKS Trailer. In great shape 34' travel trailer. With one slide, electric awning and slide, outdoor speakers. Lots to see. A few pictures are upside down if you need more I can email them to you. Sorry. Please call Joanne 403-597-0296. 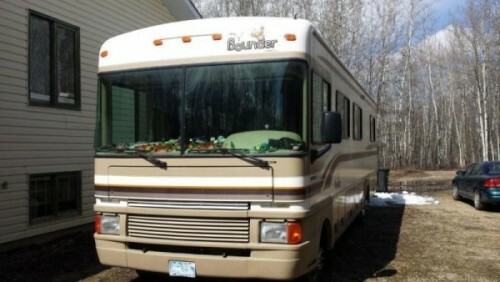 1999 Fleetwood Bounder 32Ft Class-A Motorhoime. Ford chassis V10 with a rebuilt transmission 3 years ago with steel gears and papers to show. Also rebuilt driveshaft complete and balanced, front brake pads rotors and calipers just done last year,a/c and also has 2 rooftop a/c and an Onan 5500 watt built in generator small shower/bath and lots of understorage. Runs well and no problems. 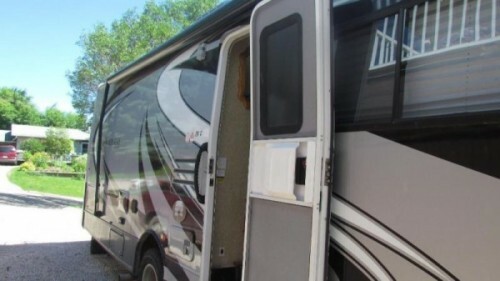 This motorhome is in Grande Prairie. Please contact at 780-814-5040. 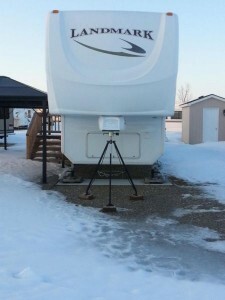 2010 Pinehurst Landmark 40Ft Fifthwheel. Excellent condition. New king size mattress purchased 2013, island in kitchen, stainless steel appliances, flat screen television, fireplace, 2 recliners, sofa bed (air mattress). Sleeps 4. Serious inquiries only. Please call 519-551-1118. 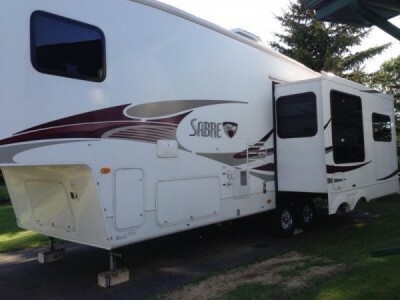 2008 Palomino Sabre 30RES 30ft 5th wheel. This trailer has rarely seen the road. Bright, clean, interior with one slide. Please look closely at the pictures to see that this unit is in great shape and a very decent buy at this price. Please call 780-458-7935. 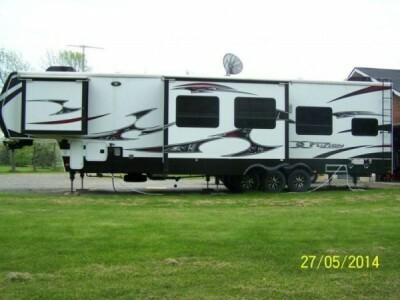 2005 Vanguard Kodiak K287SL Fifthwheel. 5000Kg GVW. Excellent condition, limited use, fully loaded unit, winter package(dual pane windows, heated compartments), full vinyl skirting, 3 slide outs (2 kitchen, 1 bedroom). Paid $64,000.00 new, original owners. 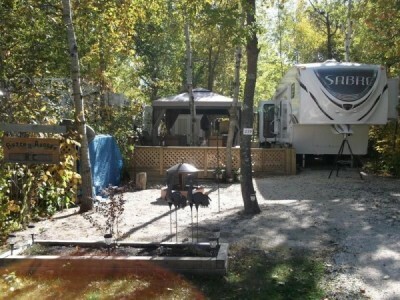 Located between Camrose and Wetaskiwin on hwy #13. Won't last long at this price. For more information call 250-354-8606. 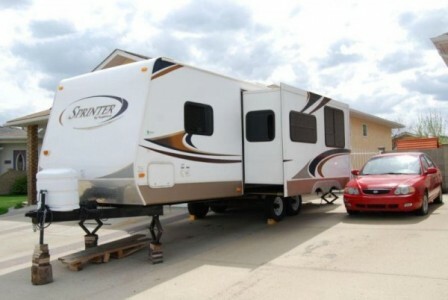 2008 Keystone Sprinter 264BHS Trailer. The trailer features ducted heat & air conditioning, LCD/DVD/ Surround Sound system, electric awning and Jack & Jill Bunk beds. 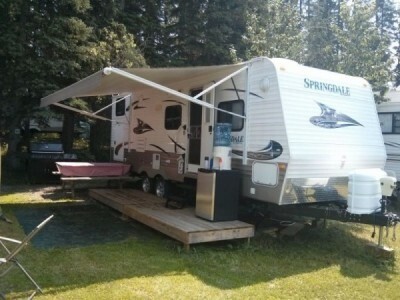 The trailer sleeps 8 persons and is excellent condition. Non-smoking & no pets. The equalizer hitch and sway bars are included. This is a solid trailer that pulls easy. Dry weight is 6625 lbs & total length is 30'. This is a great floor plan for a young family. Our family has outgrown the bunk beds and we are looking to change floor plans. Please call 502-0406 if your are interested in viewing. 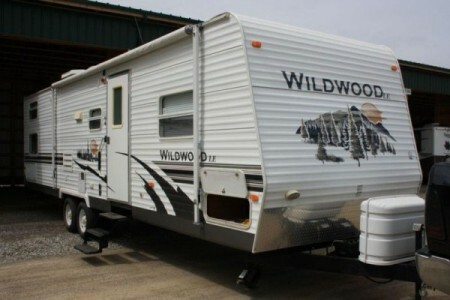 2008 Forest River Wildwood 31LE Trailer. I have a very nice 31 foot four seasons rated with a approx 14 foot slide out. 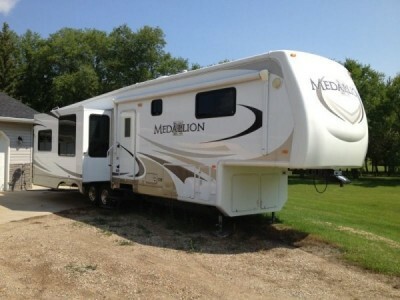 Queen bed up front, living room area, kitchen and quad bunks in the back, sleeps up to ten. Tub shower and toilet separate, sink and vanity outside the bathroom. Excellent shape was bought right after the flood when we needed somewhere to sleep for a few months, I also bought an extended warranty that is transferable to the new owner as well. There is approx three years and three months left on the warranty, unit was professionally winterized at woodys in Calgary. Looking to sell this trailer because I have never had one before and I have no use for it now that we have a house to live in again. It is very spacious, approx 300 sq feet. Also has very nice cold working a/c and heat. Everything works - had brakes and wheel bearings checked when I bought and all good. Half ton towable. I have only put approx 120 k on it and it is currently stored in a sheltered storage facility. Trailer comes ready to use with two propane tanks and also the two deep cycle six volt seriesed (makes 12 volts) batteries, for 240 a/h , was told that's the best way to go. Spare tire, as well as hoses for the tanks and an adapter to run a 15 amp cord, and nearly full length awning on passenger side. Any calls in the afternoon thru late evening only please. I'm sure I'm forgetting something. But if you would like to know please ask @ 403-993-4329. 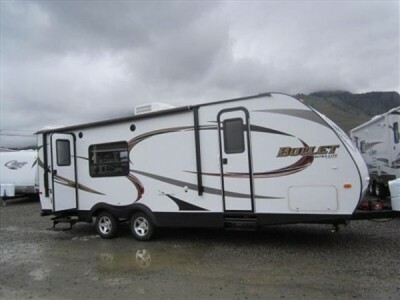 2014 Keystone Bullet Ultralite 248RKS Trailer. 28ft Bullet travel trailer, light weight, sleeps 6, rear kitchen, 1 slide, includes hitch, electric jack. Used 4 times. Please call 403-563-4066. 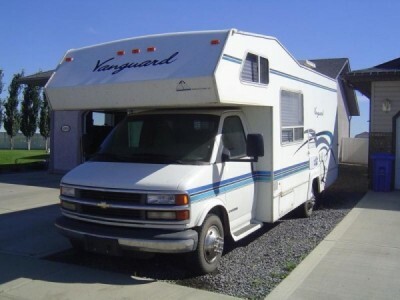 2000 Vanguard VHG24 Class-C Motorhome. 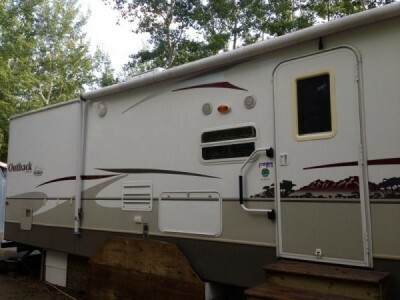 24ft, has AC, king bunk, and is in great shape. Sleeps 6 and has bathroom with a tub. Removed the chair to put in an extra fridge. Chair can easily be put back. Lots of great memories in this but the kids have all moved out and its time to let it go. Please call 780-387-6166. 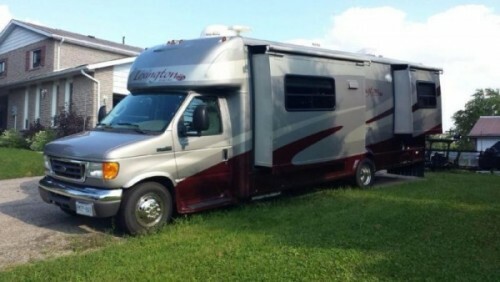 2007 Forest River Lexington GTS283 Class-B Motorhome. 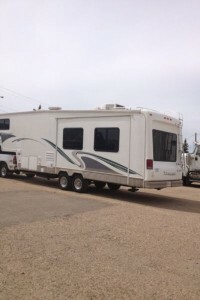 29' length, 3 slide-outs, 40,000km, all brand new tires, back-up camera, sleeps 6, bathroom with shower, stainless steel appliances and fixtures, awnings, generator, ducted A/C, entertainment center, King Dome Satellite, electric step, outside shower, outside entertainment hook-up. Please call 416-540-4180. 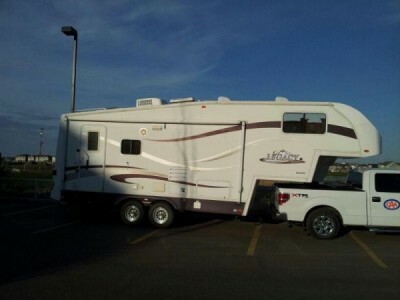 2014 Keystone Montana High Country 36Ft Fifthwheel. 3 TVs. 3 pop outs. Sleeps up to 10. Air conditioning and heat. Built-in radio with bluetooth. Please call 905-708-5568. 2008 Keystone Outback Sydney Edition 32 Travel Trailer 32Ft. 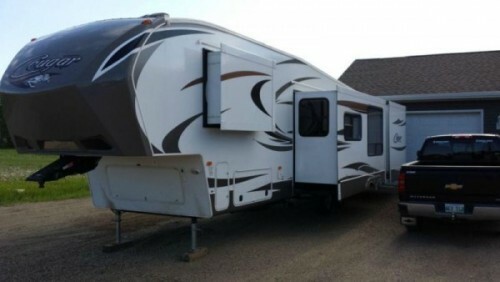 hard wall exterior, 2 slides,sleeps 9, fully loaded includes: Bell satellite dish, solar panels,outdoor kitchen, outdoor speakers & load leveller hitch. Can be viewed at turtle lake. Please call 306-893-2897. 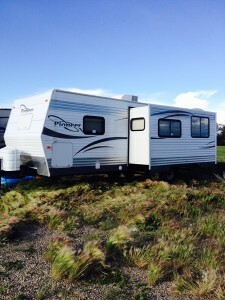 2008 Fleetwood Pioneer 26BKS. Excellent condition. 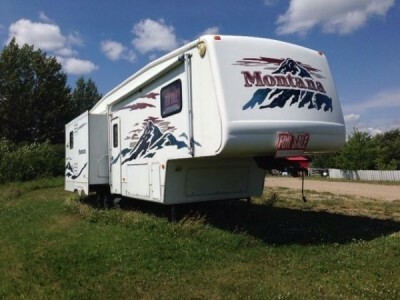 Slide out, rubber roof, electric brakes, microwave, air conditioner, propane stove, two 30 lbs propane tanks, hot water tank, full bathroom, bunk beds, queen size bed, flat screen TV, DVD and surround stereo system, couch, dining area, et cetera. Fridge and furnace run on either propane or electricity. A must see Camper trailer. Willing to through in two kayaks, a 1000 watt Yamaha generator and equalizer hitch. Call 587-377-1096. 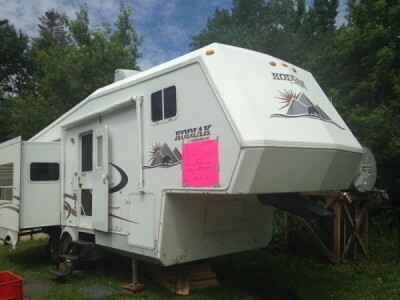 2012 Keystone Fuzion FZ412 toy hauler for sale[estate sale]. This trailer is in mint condition and never smoked in. 6 brand new 14 ply tires. 5500 watt cummins built in generator with 85 hours. $2000 shaw wingard satelite dish fully automatic. 2 built in fuel tanks with filling station. sleeps 10 with full patio set at rear. 3 pull outs with full powered canopy. 4 flat screen tv's. dual air conditionings. fireplace. built in air compressor. auto leveling hydraulic system. air ride hitch. this trailer has every possible option available and is the most expensive trailer fuzion makes. google this model to get a full list of all options and specks too many to list. also comes with 2 years fully transferable warranty. Delivery available. Please call all 905-834-5959. 2014 Pilgrim Open Range 386FLR Fifth-Wheel. Incredible style, class and value. Barely used and never towed in as brand new condition. This exact fifth when was featured in RV Lifestyle magazine’s September 2013 issue. Built in 40” Flat Screen TV. Built in generator set. Electric Fireplace. Refrigerator, range, oven and microwave all built in and brand new. Air conditioned. Extended Warranty. Plus many other upgraded features. A serious fifth wheel that pushes the limits in style and comfort Unbeatable value!!! Please call 416-525-2101. 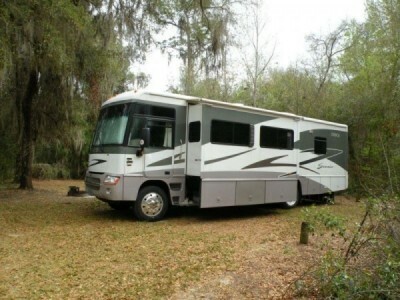 2006 Four Winds 31F Class-C Motorhome. 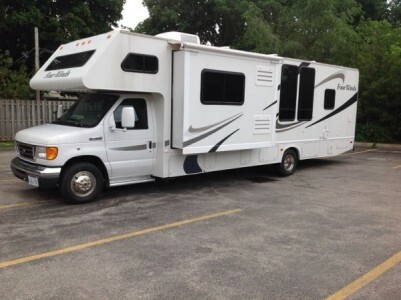 I have for sale an incredible Motorhome with very little mileage on it. Our family has grown up and just doesn't use it as much anymore. We have owned it for 4 years and are the 2nd owners. It has 2 slide outs and sleeps 7. Generator equipped. Fold up removable overhead bed. Large water capacity. Large black water capacity. Fridge, freezer, stove and conventional oven. Lots of storage space inside and a ton outside. Complete private back bedroom with wood sliding doors and on suit washroom. Washroom access able from front or rear. Glass shower. 2 TV's and DVD's Gorgeous long awning. Motorhome measures 33 feet from bumper to bumper. Drives perfectly and smooth. Absolutely never had any problems with it. To soon to depart with it, but life changes. Hoping to find a good home. When purchased 4 years ago, the price was $69,900.00 - We purchased it a little bit lower than that. All serious offers will be considered. Ready to drive away next day. Call 226-791-4489. 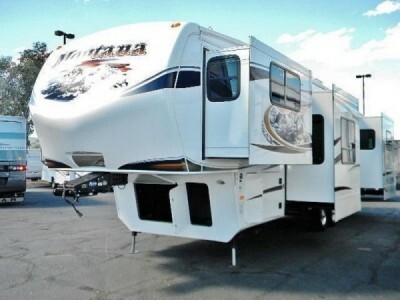 2004 Keystone Montana 34 Fifthwheel. Three slides, solar panels, A/C, Queen Master, Satellite, 2 flat screen TV's, 2-12 volt batteries, central vacuum and fire place all in excellent condition. Please call 780-542-0391 or 780-898-4700. 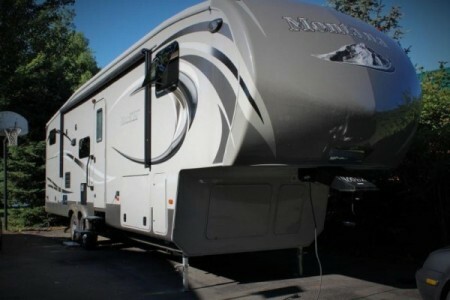 2012 Keystone Montana 3750FL Fifthwheel. Deluxe 5 slide FRONT LIVING ROOM RV. One owner... NON SMOKERS, NO PETS. 2 bdrm slides, 2 LR slides, 1 DR slide, Gel-Coat exterior, REMOTE CONTROLLED landing gear, stab. jacks, awing, all slides and floodlights! Arctic insulation pkg, Exterior convenience center, Pass through outside storage, Heated enclosed/insulated underbelly, MOR/ryde® suspension and MOR/ryde® 5th wheel pin box, Dexter E-Z Lube® axles, Aluminum wheels, 2 AC’s (living room & bedroom), Elec./LP hot water, LP furnace, Entertainment center w/42″ Samsung TV, FM/CD/DVD player/5.1 surround sound, Electric fireplace, Computer desk, Ceiling fan, Sofa w/Queen air bed, ‘L’ shaped sofa, Central vac., Free standing swivel/sliding table & 4 Chairs, DuPont Corian® countertops, 3 Burner Range w/oven, 4 door double wide frig, Residential microwave, 3 fantastic fans, Porcelain toilet, Neo-angle shower, Washer/Dryer prep., King bed, HD TV in bedroom, Cedar closet. Please call 226-783-9506. 2005 Itasca Suncruiser 33V Class-A Motorhome, 33ft. Workhorse chassis, 8.1 L Vortec V8 gas engine, Allison 1000 electronic 5-speed overdrive transmission, 145-amp alternator, 4-wheel ABS. Banks Power package increases horsepower by 50 hp and gives 15% better gas mileage. Easy to drive - wife drives it. Two slide-outs, microwave/ convection oven. Electric awning with wind sensor, 2800 W Magnum inverter/charger with 125 amp charging rate, Onan generator. Catalytic (Wave 8) Propane space heater, Demco tow bar, Winegard Minimax satellite receiver, HDTV, hydraulic jacks, LED lights, 4 large golf cart batteries providing 500 amp/hours of power. 3-burner range-top with storage drawers below. Four slide-out pantries. Non smokers. 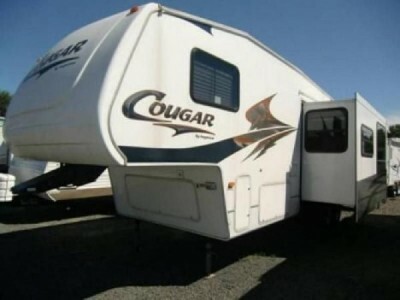 This RV is ideal for dry camping. Please call 613-749-9537. 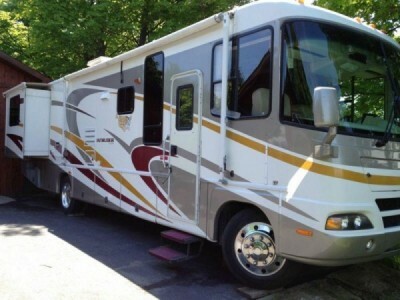 2005 Intruder Damond 30 Class-A Motorhome 35Ft, ford chasis, V10 engine triton, good condition, Michelin tires XRV, slide out living room and master, generator 8000w. Please call 613-577-1412. 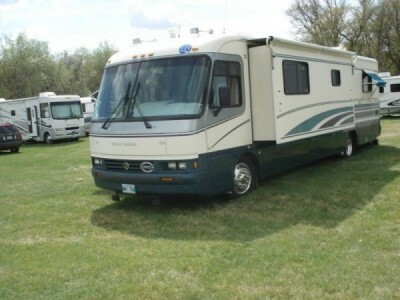 2003 Glendale Titanium 37 Fifthwheel. 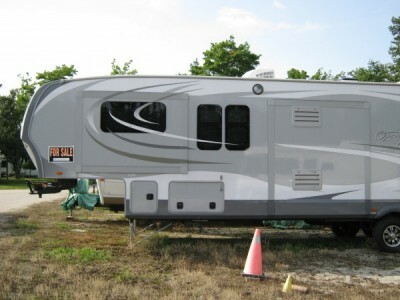 Estate sale - selling this 2003 Titanium Holiday Trailer. Great condition. Lots of room. Needs to go. Available on short notice for viewing. Lots more info available. Come take a look at it! Call Mitch at 780-220-3707.